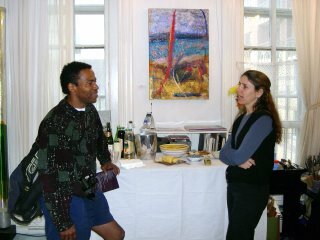 Join us for “Turning the Page – Installment #2,” a reception and exhibition featuring three artists from the Washington Project for the Arts\Corcoran (WPA\C) 2006-2007 Artist Directory. 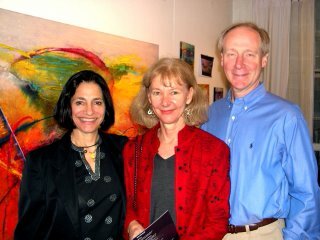 The artists are Kay Chernush (kaychernush.com), Farida Hughes (faridahughes.com), and Mike Weber (mike-weber.com). Public transportation is recommended. Call the Studio (202.265.5640) for directions. RSVP to adamsmorgan@dwr.com by Monday, December 5. WPA/C staff apologizes for the Artist Directory delay..."The new WPA\C 2007 Directory release is postponed for reprinting in order to ensure the highest quality." Canopy, 20" x 16" Acrylic ©2003 Anne Marchand. Heart Song, 9" x 12" Acrylic ©2005 Anne Marchand. 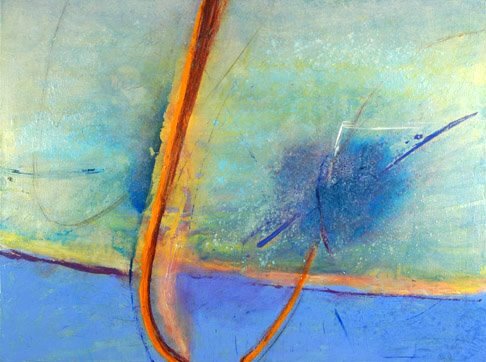 Many organizations are asking artists for fine art donations during the holidays to help their fundraising efforts. 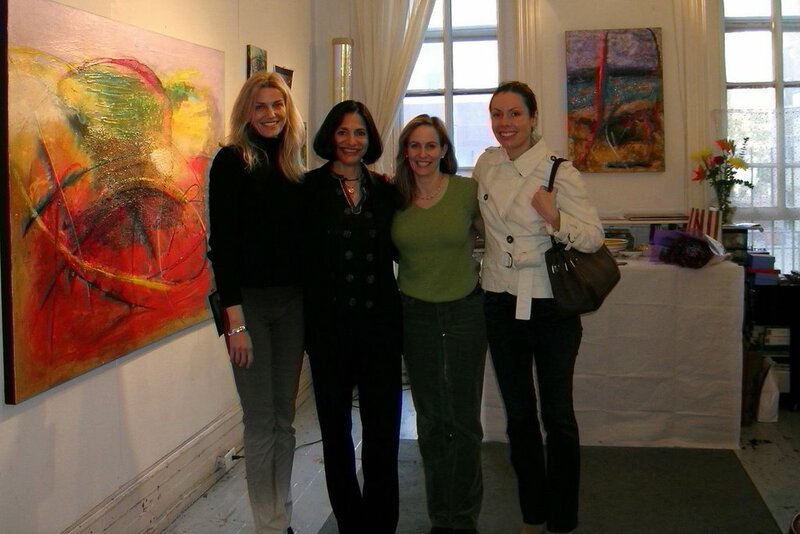 While art benefits are charity minded, I support those who give back to the arts community. By helping artists to contribute a percentage of their sales to charity, an organization creates a win-win for the artist and the charity. Call me dreamy in this capitalist society of ours, artists are part of the economy of life - of richness, of meaning, of truth, of creativity and of economic value. So let's spread the wealth and keep on giving. I commend Coldwell Banker for their contributions to the arts community and to the important issues of our larger society. Reception: December 1 from 5pm-8pm. Support 50+ Local Artists by helping to raise funds for this worthy cause. Donations are accepted. When my mind gets to wanderin', I find it truly extraordinary to examine the seeming coincidences in my life and in the world at large. When I cleaned out a drawer in my office, I got a new contract. When I stopped worrying about the solution to a problem, a solution appeared that I NEVER would have thought of. He describes the many "playful, imaginary combinations" (p. 224) that Leonardo made. How does this relate to — connect with — our expression of creativity? As artists we delight in "playful, imaginary combinations" — we're in the business of creating things that didn't exist before. Our playfulness can be seen when we manipulate objects, words or ideas into new forms simply because it delights us to do it. And we specialize in combining colours, thoughts, words, textures, designs, ideas, movements, notes, or other things in two's, three's or more, until we end up with a completely NEW thing. Many artists I spoke to during the Creativity Interviews spoke about not feeling whole unless they were expressing themselves creatively. Creating is our way of connecting with the world, expressing our emotions and affections and finding the place where we belong. It's the way we make sense of the world and our own thoughts, and it's the way we seek and achieve spiritual expression. When we're creating, we tap into a flow of creativity that exists everywhere and through all time; we're connected to everything that's ever been created and everything that ever will be created; we're connected to everyone who's also connected; we're connected to a flow of divine energy. No wonder being blocked from our creativity can be so painful and lonely. All of a sudden we go from being "part of" this immense connection, to being all alone and cut off. Cut off from a part of ourselves; cut off from creativity as a whole. So what is the origin of an expression of our creativity? Come celebrate the holiday season at DC's first outdoor festival market. Enjoy the unique shopping experience of an amazing range of people and products from all over the world. Antiques, art, crafts, imported goods, and much more will be displayed. There will be Christmas trees and wreaths, an array of food, apple cider and other hot beverages for sale, and holiday music for your enjoyment. The market opens on Thursday December 1st and the event continues for 15 days, from Thursday through Sunday each week and Monday through Wednesday Christmas week. Drop in every and any of the days to experience different exhibitors and a wide, varying array of goods. Trees will be for sale every day until December 23rd. 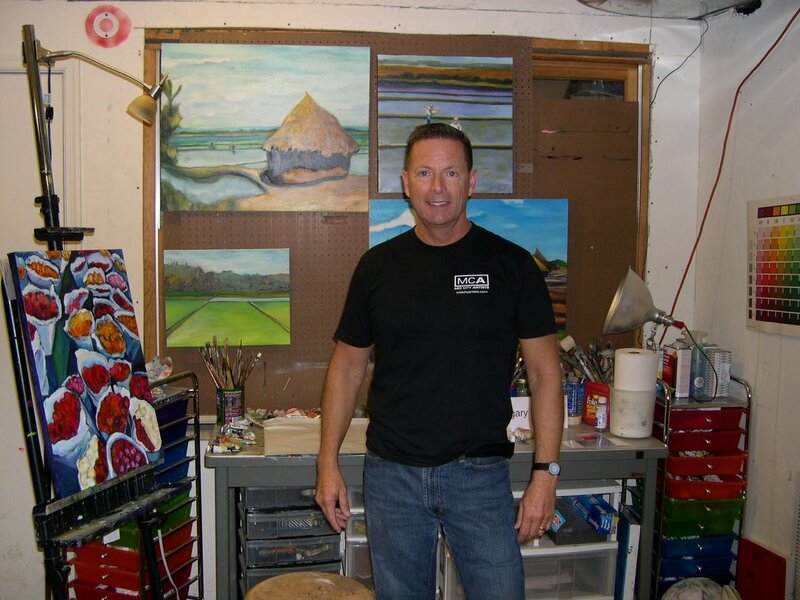 Eric Doeringer is an artist who makes paintings. But he does not exactly obsess over them, wrestling Pollock-like with his muse. In fact, as he explained the other day, "I make them in batches - so I can usually do somewhere from 6 to 15 in a day." "It's like an assembly line," he said cheerfully. Art Basel Miami Beach, the international art show in Miami Beach (Florida) is the American sister event of Art Basel in Switzerland, the most important annual art show worldwide for the past 36 years. Art Basel Miami Beach is a new type of cultural event, combining an international art show with an exciting program of special exhibitions, parties and crossover events including music, film, architecture and design. Exhibition sites are located in the city's beautiful Art Deco District, within walking distance of the beach and most hotels and restaurants. An exclusive selection of 195 leading art galleries from North America, Latin America, Europe, Africa and Asia will exhibit 20th and 21st century art works by over 2000 artists.The exhibiting galleries are among the world's most respected art dealers. They will be showing exceptional works by both renowned established artists and cutting-edge newcomers. More information is available at Art Basel. Please join the Embassy of Switzerland for a viewing of several short films by Jason Zimmerman, a graduate in photography from the Corcoran College of Art & Design in Washington. Since his graduation two years ago, Jason has branched out into new media, sculpture, video and digital media. When asked to film the demolition of the Swiss Ambassador’s Residence in December 2004, Jason rose to the challenge with a powerful video piece called The Demolition. 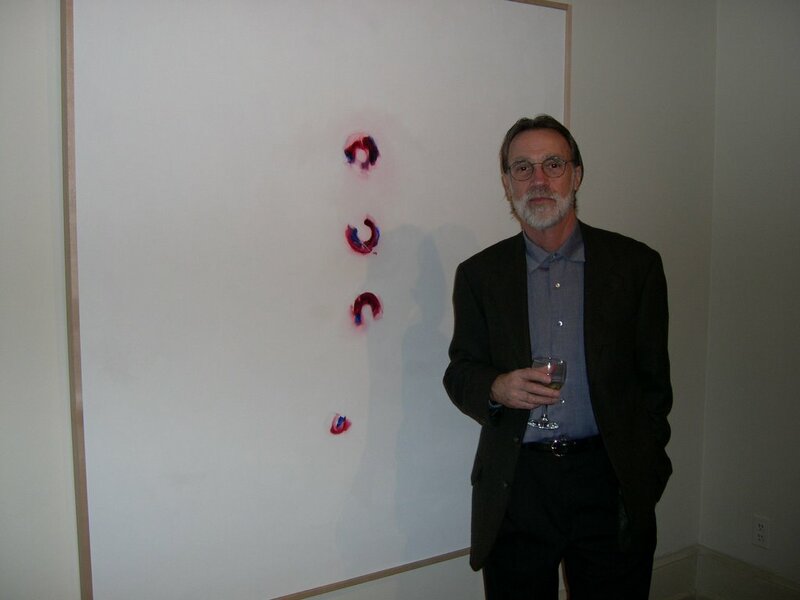 For his work, he has been selected as one of ten finalists for The Trawick Prize: Bethesda Contemporary Art Awards. Visit the website for a complete program of the evening’s films. Vin d’Honneur to follow. For a downloadable PDF of the embassy's fall '05 cultural events calendar, click the following link Embassy of Switzerland, Washington, DC USA. Eric Maisel and it was too good not to share with you. Thanks Eric! "When I dissolve in love, the force of love creates without me." 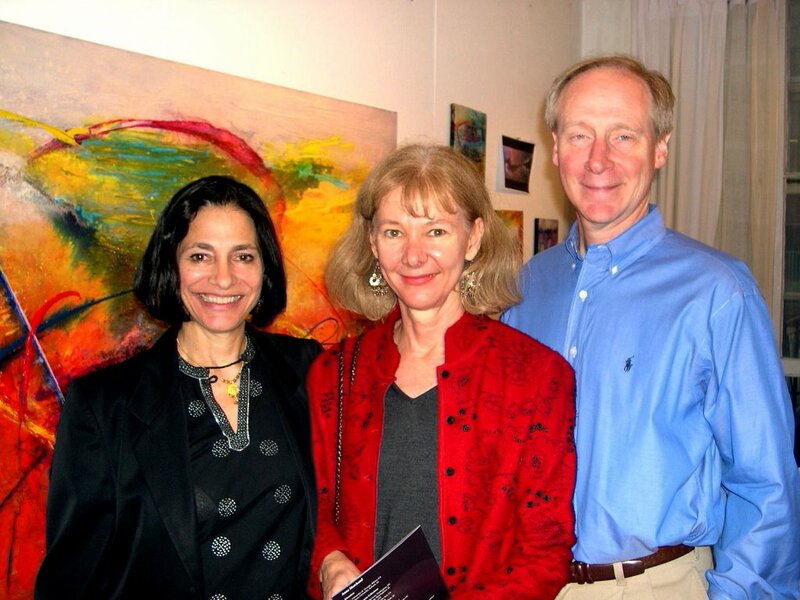 ￼More news on artists receiving deductions for Fair Market Value of their art donations. 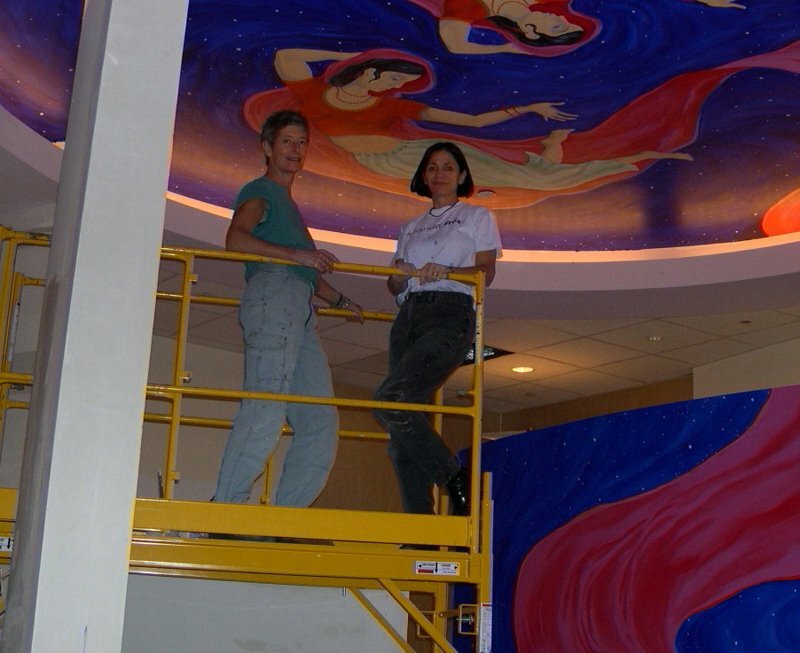 There is a bill just passed in the Senate that would expand the deductible amount of donated artwork to its full value. Currently the only allowed deduction is cost of materials. However, THIS BILL HAS NOT PASSED THE HOUSE. That's where you come in. The bill will be hashed out in a House/Senate committee that begins to meet soon. "Living writers, musicians, artists and scholars who donate their work to a museum or other charitable cause would earn a tax deduction based on full fair market value under a bill just passed by the Senate. Authentic Art posts an upcoming exhibition by young realist painter Drew Ernst. There's an interesting interview of American Figure Painter, Philip Pearlstein by Phong Bui, artist, curator, editor and publisher of The Brooklyn Rail. Read the interview here. Pearlstein exhibited in September 2005 at the Betty Cunningham Galley in Chelsea. "Pearlstein has been exhibiting in New York since his first one-man show in 1955 at Tanager Gallery on East 10th Street. 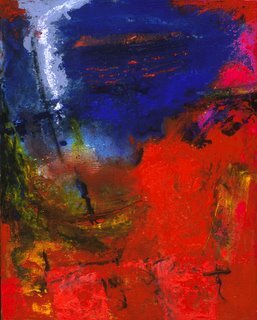 He is the artist of his generation who understood, and briefly explored, the tenets of the Abstract Expressionists, but whose style and methods of expression led away from the abstract to a more concrete, initialized view of the world and the human body." 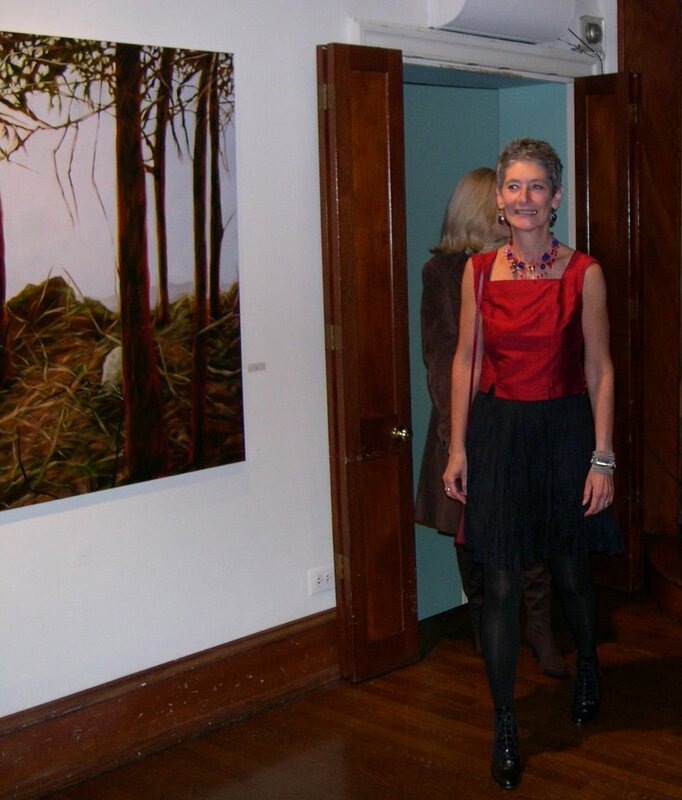 For a look at his exhibition at Betty Cuningham Gallery Click here. Urge Your Representative to Support the Artist Deduction Bill. Americans for the Arts urges the U.S. House and Senate to enact legislation that would allow artists to take a tax deduction for the fair market value of works that they create and subsequently donate to arts organizations. Under current law, artists can deduct only the cost of the materials used to create the works, whereas non-artists can deduct the works full value. Federal: Artist Deduction Bills Introduced in Congress. Early in the morning of November 18, the Senate approved a measure that would allow artists to take a tax deduction for the fair market value of works donated to charitable organizations. All you do is enter your zip code and it will automatically give you a written letter at American for the Arts website and the correct legislators to email it to. Feel free to forward to as many artists and others as you can. I wonder why the day is gone and I have much to do. I saw the excellent Sam Gilliam Retrospective at the Corcoran Gallery of Art. I enjoyed seeing the creative stages through which Gilliam has passed. 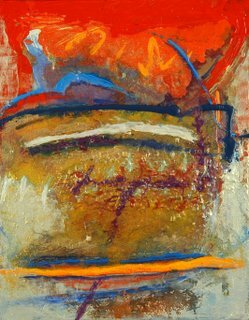 His is a very impressive and muscled abstraction. Gilliam has had museum support for much of his career. His work is proof that he is an important American painter working in abstraction today. I love the bigness of his work and the textural richness. It’s vital to see the contributions of other artists and refresh one’s own spirit. Angela White's new work with the human form is thought provoking and rich with symbolism. This will be a landmark exhibit for this Washington, DC talent featuring new works on paper. I went downtown to Penn Quarter expecting to visit the Zenith Gallery and Touchstone Gallery during the (monthly) 3rd Thursday gallery crawl. I found out that The Cultural Development Corporation (CuDC) is no longer holding this monthly event. This is exactly the type of event that needs to continue downtown to celebrate the arts and get the public out to experience the vibrant artscene in the Penn Quarter of Washington, DC. Can someone tell me why CuDC stopped 3rd Thursdays? 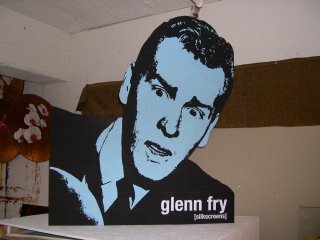 I, for one, met hundreds of folks over the year coming through the Zenith Gallery during 3rd Thursdays. Why go to all the trouble to develop a program for the city and then withdraw it when it becomes popular? 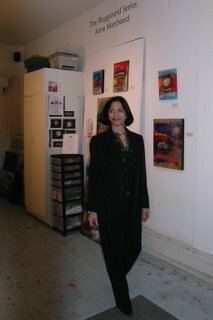 Zenith Gallery owner, Margery Goldberg happened to be in tonight when I came by. As we spoke, six people popped in at 7pm thinking we were having a 3rd Thursday event. We let them look around a little and then closed up the gallery.The lights should be staying on in DC's downtown galleries. Hey CuDC! We want our event back...PLEASE! The Cultural Development Corporation (CuDC) is a private, nonprofit organization based in Washington, DC. 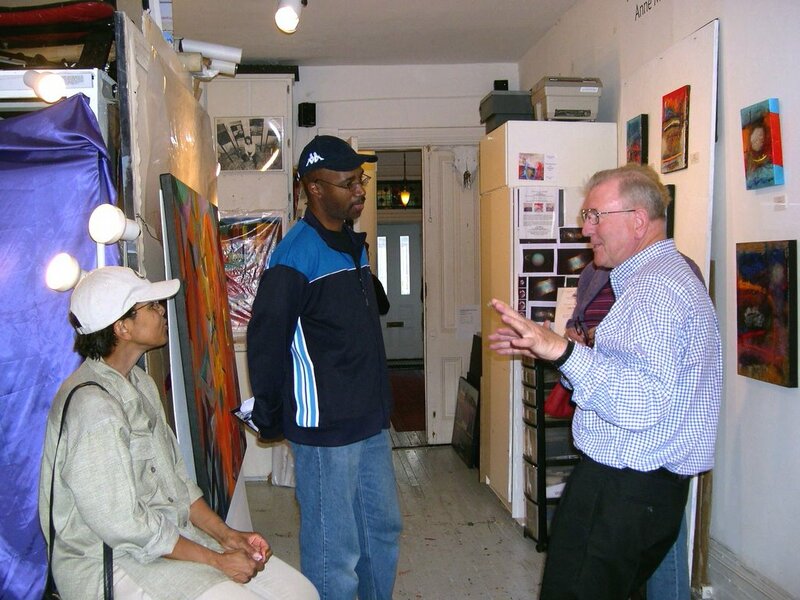 They engage artists and arts organizations in community development and neighborhood revitalization efforts to stimulate economic growth, expand the city's cultural horizons, and improve quality of life in the nation's capital. Their website still invites everyone to Join the monthly 3rd Thursday gallery crawl. Anybody home? I hopped the metro to go to the Penn Quarter District in Washington, DC. A former student of mine, Mary Ott is showing “New Work by Mary D. Ott,” at the Touchstone Gallery (www.touchstonegallery.com) in Washington, DC, USA from November 9 through December 4, 2005. I found Mary preparing to demonstrate her technique of painting with thread on canvas to achieve a rich grass effect. Mary Ott is an accomplished printmaker as well as painter. 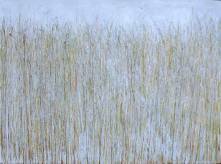 Her canvases are minimal renditions of color with grasses built slowly by painting with threads. 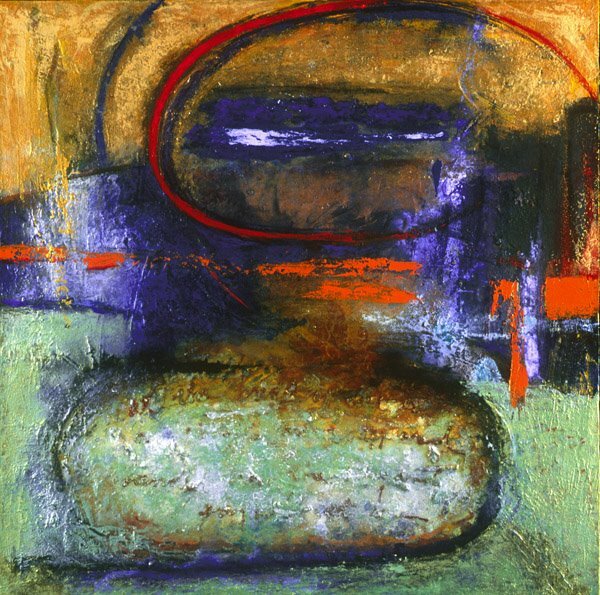 Ott described the process as meditative. The work incorporates Ott's successful printmaking techniques with a painters sensibility. 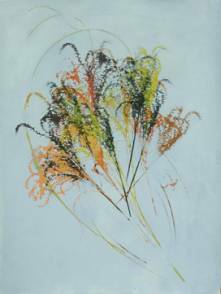 The artwork includes luminous paintings of grasses created line by line using embroidery yarn and acrylic paint. Prints such as screen prints, monotypes, and intaglios are included as well. 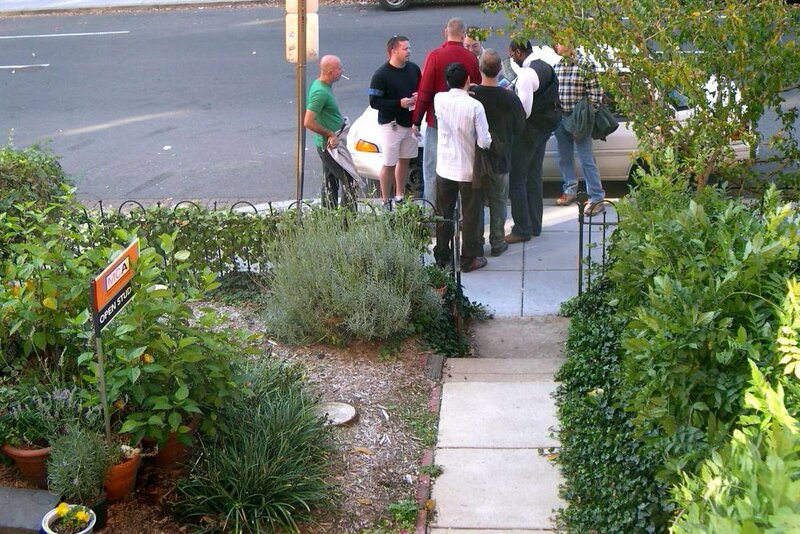 Touchstone is located at 406 7th St., NW, Washington, DC 20004. Gallery Place/Chinatown Metro station and Archives Metro station. 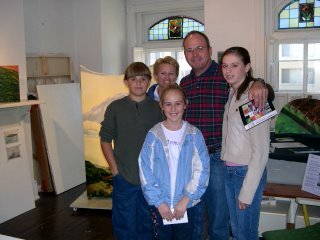 The Touchstone Gallery is open Wednesday through Saturday 11 am to 5 pm and Sunday from noon to 5 pm. 202 347 2787. 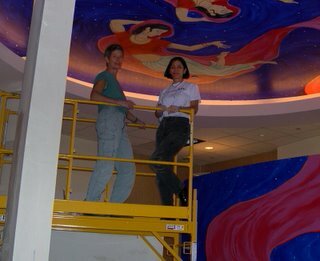 Washington, DC landscape painter and muralist, Freya Grand is creating a series of murals for the upcoming Tandoori Nights Restaurant located in Arlington, VA. She did the murals for the same owner in their Kentlands location. We've just put the finshing touches on the ceiling mural. Tandoori Nights is scheduled to open in December. If you love Indian Food like we do, you won't want to miss this new lush environment for dining. Artists and Visitors at Mid City Artists Open Studios. All sorts of folks came by including art collectors, media, community, and local artists to check out the art scene. Here's some pics from the day. That's all folks! Next show and tell is Springtime. See you then. It was a wonderful brisk day with a lot of foot traffic to Open Studios. I talked nonstop to community members, friends, artists, art patrons and media folks. Since I was talking artspeak all day, I didn't take pictures and had to wait until Steve came by with his camera. He shot a few pics of me with some of our visitors. Telephone reports from other artists confirmed that folks were excited about the event. I heard glowing reports all day about our lively arts scene in Mid City DC and the good artists that are here to stay and make a scene.Tomorrow we are open from 12- 5pm. Come visit! We have Angela White, Freya Grand and myself. Close by is Nicolas Shi and Jody Bergstresser. 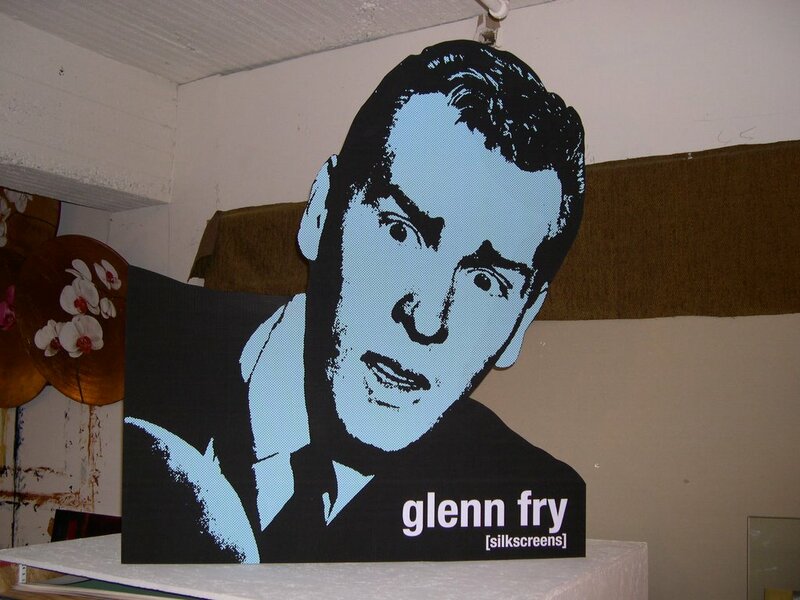 A few blocks east of us are Gary Fisher, Glenn Fry and John Talkington. Sculptor, Robert Cole is a couple of blocks north plus many more artists studios are in walking distance of Dupont, Logan Circles and Shaw. I am hanging three of Sondra Arkin's works in La Petite Galerie in my space. 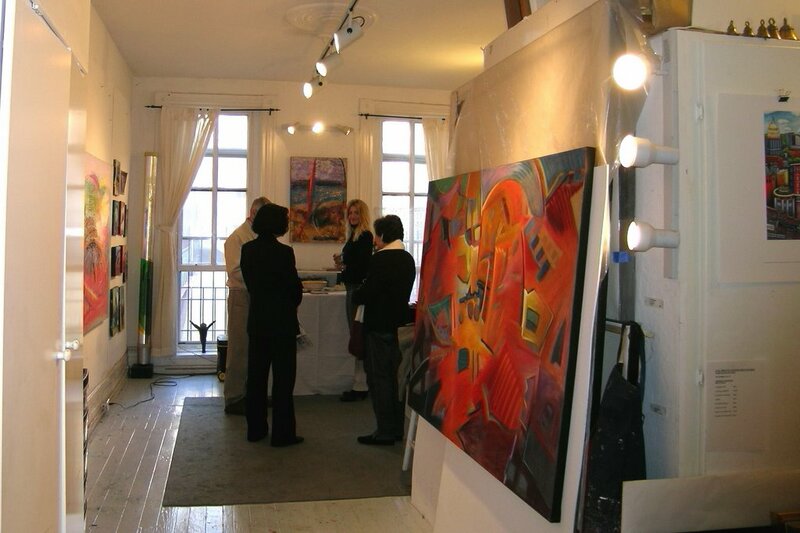 Here's a glimpse of my studio with some of our visitors. 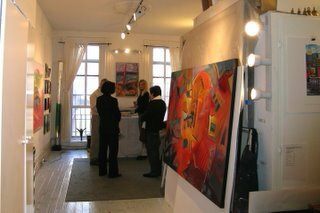 Mid City Artists Open Studios. 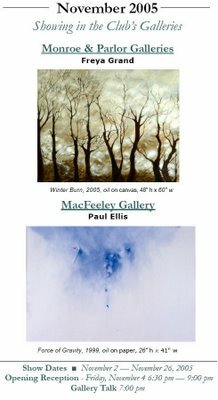 MID CITY ARTISTS OPEN STUDIOS - TODAY & TOMORROW. Come see us in the Nation's Capital, Washington, DC USA, Nov. 12 & 13 2005, 12-5PM as seen on NBC4's news with Wendy Rieger. "There's something for everyone." Go to WWW.MIDCITYARTS.COM for a walking map. 1 Day today before Open Studio tomorrow. 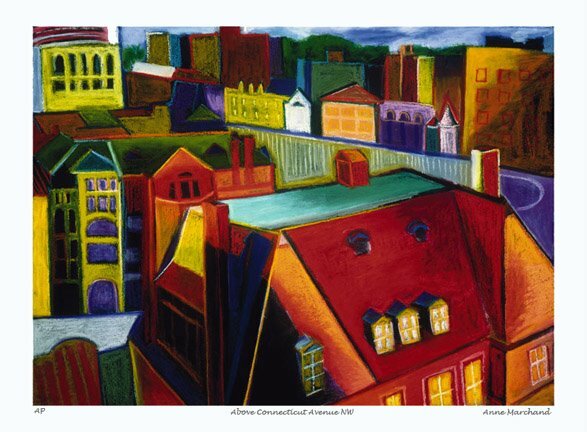 Cityscape Giclee Print of Dupont Circle rooftops. © Anne Marchand. All rights reserved. 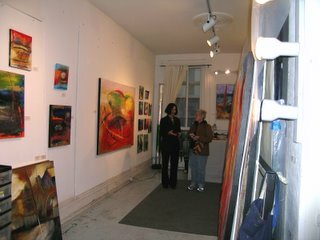 Wendy Rieger did a newscast tonight at 5:30pm on the burgeoning artscene in the neighborhoods of Shaw, Logan and Dupont Circles with the Mid City Artists. Come see us tomorrow and Sunday from 12-5pm! 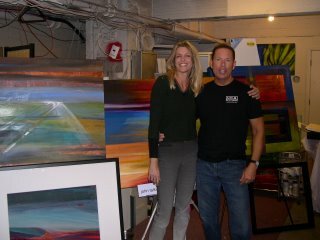 I met with Wendy Rieger of NBC News 4 this morning for an interview on the Mid City Artists Open Studios. Ms. Rieger will cover Mid City Artists Open Studios on NEWS4 at 5pm, Friday and on Saturday morning. Watch for the newscast! Artist, Mike Weber and I will be promoting the burgeoning, dynamic arts destinations in Dupont, Logan and Shaw neighborhoods. You may get a glimpse of one or both of our studios. Mid City is teeming with new businesses, galleries, artists studios, restaurants and shopping while retaining it's unique flavors. Come see. When I observe the architecture of Dupont and Logan Circles and the Shaw neighborhood in Washington, DC, I see geometry in motion, ornamentaion, humanity, many craftsman's hands and humanitarian minds. The architects who built our city at the turn of the century exhibited a sense of style, warmth, community, beauty and inspiration in the rowhouses they designed. I am reminded of the ideals of balance and proportion along with a love for delightful ornamentation and rhythm. This print echoes some of the rhythms that make up our living environs with a whimsical emphasis on color and movement. It is part of my Dupont Circle Series direct from the neighborhood. 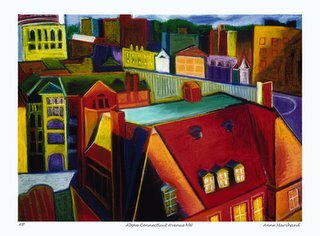 This limited edition giclee print, "Over 20th Street, NW," measures 20" x 30". © Anne Marchand. All rights reserved. Mid City Artists Open Studios. Come visit my Studio on Saturday & Sunday, November 12 & 13, from 12-5pm. 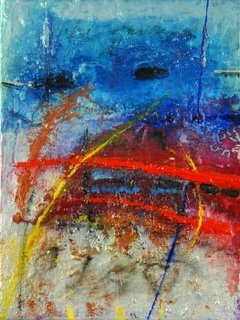 I'll be offering abstract and cityscape paintings, giclee prints and posters. 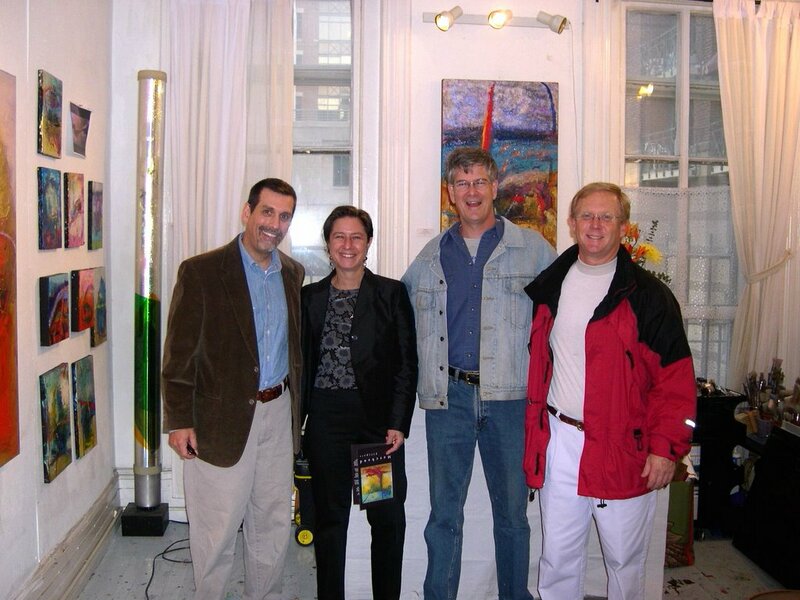 My studio is in Dupont Circle, 2 blocks from Dupont Circle Metro. You can download a Mid City Artists Walking Map here. 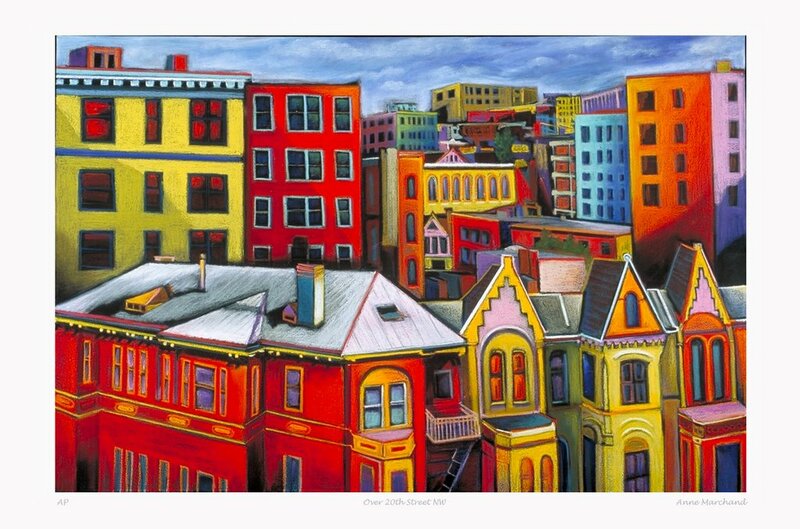 I'm going to throw a curve ball and show you a new giclee print which is in my cityscape style. I have been in love with the architecture of Washington, DC since way back when I arrived here. I can't help but see the energy and vitality which exists in Washington, DC. 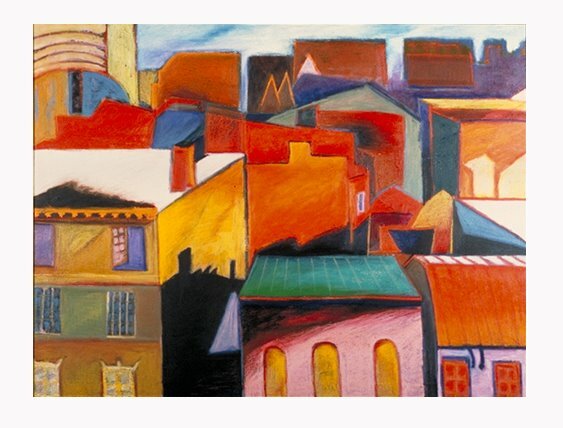 I translate that into bold, colorful cityscape paintings which celebrates the turn of the century architecture. This print reflects my love of shape, color and movement. It is part of my Dupont Circle Series in our lovely DC Neighborhood. 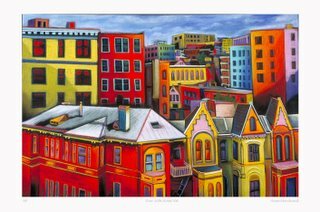 This is my largest cityscape giclee print in a limited edition of 50. 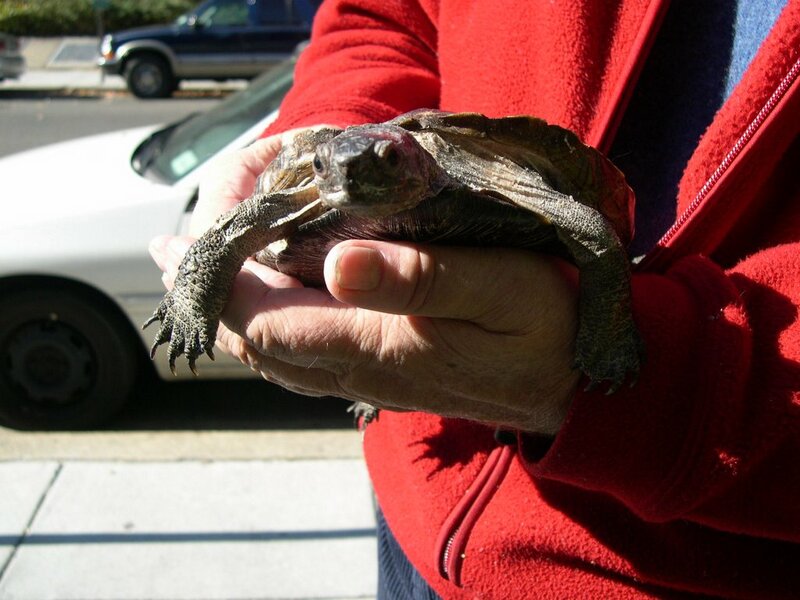 Above Connecticut Avenue measures 32" x 44." © Anne Marchand. All rights reserved. It will be available to order. 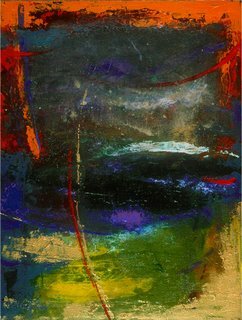 ABUNDANCE II, 11" x 14" Mixed Media on Canvas. © Anne Marchand. All rights reserved. Imagine tens of thousands of people around the world connecting in real time over the internet to find solutions to key urban issues. Imagine a radically new form of global problem-solving that promises to empower people to take charge of decisions that affect their lives. Imagine the results that could be achieved by this unprecedented global conversation and collaboration. This is the Habitat JAM. I saw a good friend whom I haven't seen in several months today. It made me appreciate the beauty of friendship and the shared humanity that we all experience. I am relishing the cool breezes and crisp light of Fall with a feeling of gratitude. Does everyone feel the yellow softness and dazzle of the leaves? A fellow artist says it affects her on a physical level leaving her with a feeling of radiance. I'd like to be able to trace a trail of radiance in my life but I will leave that to another night. Tonight's painting won't load, so I will have to leave it to your imagination. 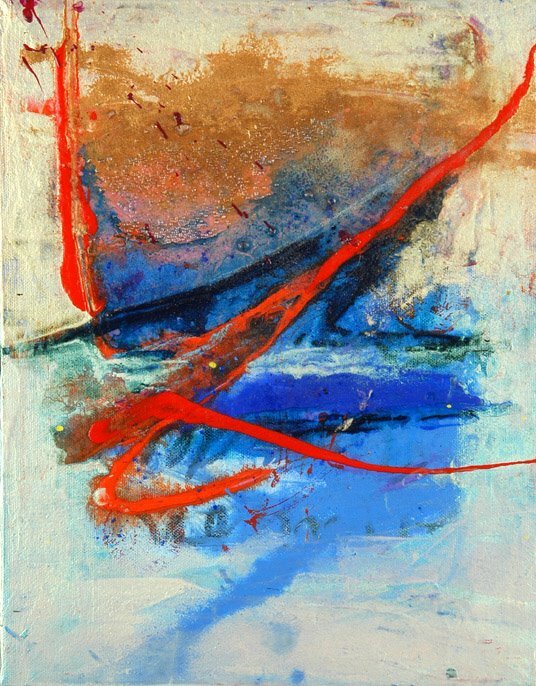 Movement and rhythm in a rectangular format with some blue and red primary colors softened by layers of iridescent passages of white and creams with ecstatic, points of blue and orange, piercing the morning bronze. Today's task was to sort, clean, prepare, discard, select, and discover, all in preparation for what I will be exhibiting for Open Studio. It feels tangible now that things are in chaos. I can see the paintings coming together in a new and creative way and that's exciting! Here's a new work which will send your mind spinning. It's a large piece, 48" x 60". Transparent Calligraphy © Anne Marchand. All rights reserved. Untitled, 9" x 12", acrylic and mixed media on canvas. © Anne Marchand. All rights reserved. 7 days and counting until Open Studio. In the November issue of Art Calendar Magazine, Creativity Coach, Eric Maisel has an article called “Cracking the Egg” which deals with resistance. He says that “painting each day requires that we crack through a shell of resistance that can frighten us to crack - except when it doesn’t. You know the difference.” To paraphrase... a hard shell arises somewhere in and encircling our bodies. Step one is to crack that shell of physical resistance and create. The second area of resistance that Eric Maisel mentions fascinated me today...our resistance to staying put. It is interesting to watch my own resistance to creating. I managed to stay put today and paint, even in this glorious weather. Instead of abandoning the work, I took an “apple break”. When I was ready to leave the studio, I could say it was "an honorable painting stint". Artist Paul Ellis at the Opening Reception. 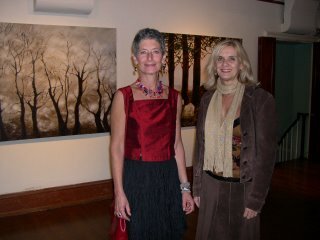 Artists Freya Grand and Angela White at the Opening Reception. Abundance, 11" x 14", Acrylic, Sand, Mica on Canvas. Anne Marchand from the "Ellipsis Series". Gratitude is a state of mind I wish to develop at all times. Here's my painting for day 8 which was finished last week. Arc Point, 36" x 48", Acrylic, Sand, Mica, Pigment on Canvas. Well, seven hours on the computer to recreate a design for a public art project today!. Can't complain as I love making art- virtually or otherwise. It's all love of creation! Here's my painting pick for day 9. Hope you enjoy it. It is one from my newest series " Ellipsis". This one will be on display during Open Studio but it's already been "taken", as they say. From the Center, 31" x 31", Acrylic, Sand, Wood Chips, Mica on Canvas. Anne Marchand from the "Playground Series". Another WOW day teaching watercolor class. catching up at lunch with an artist friend, the roofer's diagnosis, yipes!, and the Art Benefit tonight at the National Museum of Women in the Arts. When does an artist get to rest? Not on her laurels, I'd bet. Here's the new offering on day 10. Come see it at my studio during Open Studios. Mid City Artists Open Studios, come visit my Studio on November 12 & 13. 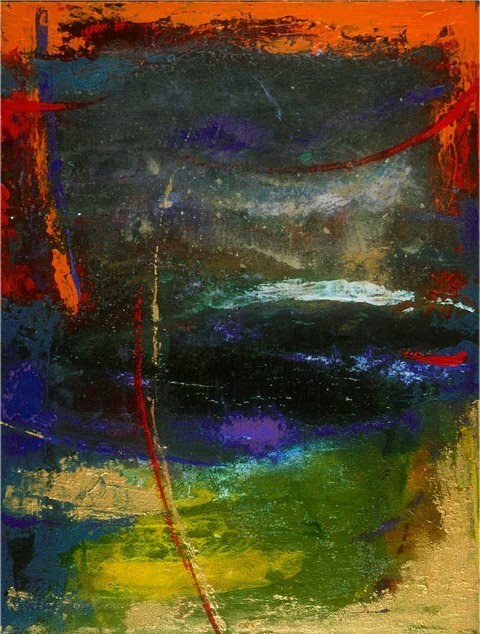 I'll be offering abstract and cityscape paintings, giclee prints and posters. You can download a Mid City Artists Walking Map here. Wow, I'm home late after finishing up with two new paintings that are going out tomorrow to a Fall benefit. My long time photographer, Greg Staley showed up at 10 am and spent a good 3 hours photographing the paintings. I'm doing some smaller canvases to display for Open Studio weekend as well as the larger work. I still have more painting to do! Preparing for these events is an interesting exercise all in itself, painting the walls, sorting and selecting work, cleaning, hanging work. All this and more painting (and some other projects too!) over the course of the next 1 1/2 weeks. I came across an older canvas today which didn't work. I took great pleasure in cutting it up. Throwing things out clears way for the muse to re-enter. In preparation for Mid City Artists Open Studios, I am putting one image a day up that will be displayed in my Studio on November 12 & 13. 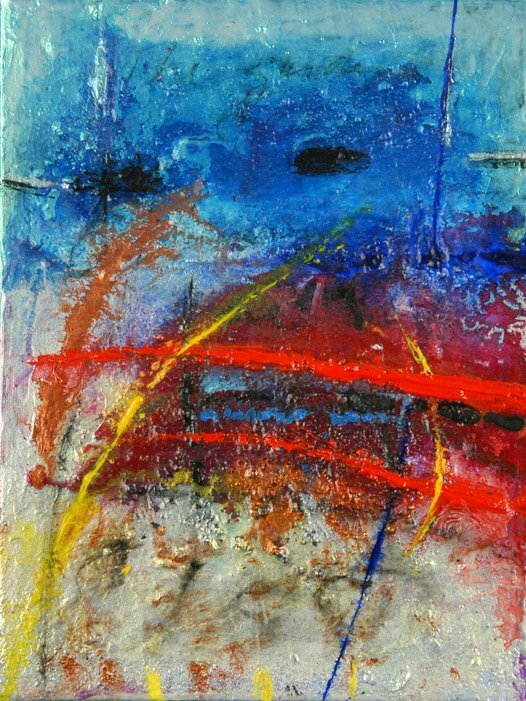 I'll be offering abstract and cityscape paintings, giclee prints and posters. You can download a Mid City Artists Walking Map here. 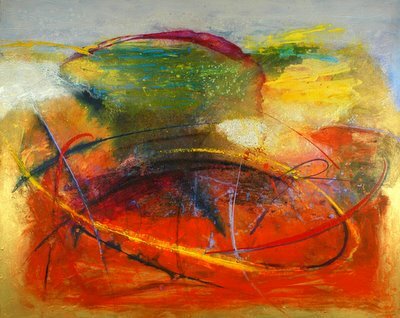 I love this piece, It reminds me of the innate light which permeates each individual. Illuminata, 24" x18", Acrylic, Sand, Mica on Canvas. Anne Marchand from the "Playground Series".